I am delighted to present the 2018 Research Report for the University of Maine. This has been an outstanding year for research and scholarly achievements at Maine’s flagship research university. As one of the nation’s select land, sea and space grant institutions, the University of Maine for over one and a half centuries has been at the forefront of educational advancements, research innovations and community impact. 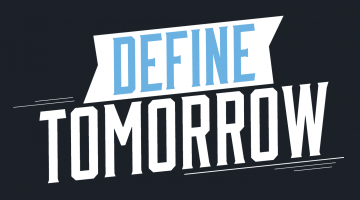 By building on this foundation, and as the unfolding of the 21st Century and its rapidly changing social and economic needs and challenges are taking place, the University of Maine is pursuing a strategic roadmap to grow and advance as a modern 21st-Century research university of global impact and local relevance. Specifically, the main features of the roadmap and its supporting activities consist of removal of silos, emphasis on interdisciplinary and integrated research and teaching, high-impact experiential learning programs, personalized educational paths, core/shared research resources and facilities, and research commercialization and economic development. Examples of these efforts are highlighted in this report. While advancing as a modern 21st-Century research university, there has also been emphasis on growth of the research enterprise and its impact on all aspects of the university mission. 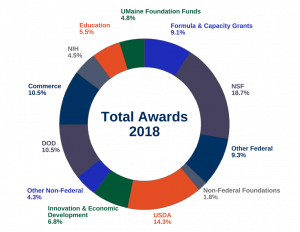 In 2018, research expenditures reached $129.9 million, a 31 percent increase over the previous year, and as shown by the examples provided in this report, resulting in significant impact on diverse areas ranging from the energy, environment, marine and forestry sectors, to revitalizing communities, preserving cultures and improving human health. To learn more about the impactful research and scholarly achievements realized at the University of Maine, I invite you to visit our research web page or contact us at research@maine.edu. A world-class research university of global impact and local relevance, resulting in maximum socioeconomic impact on Maine and beyond. Undergraduate researchers worked throughout the state of Maine in 2018, immersed in research that spanned from Casco Bay to Eastport. The project brought together researchers at the University of Maine, University of Southern Maine and University of Maine at Machias in biotechnology, aquaculture and marine technology, and environmental technology sectors, exemplifying the strength of interdisciplinary methodology. In 2018, Science for Economic Impact and Application (SEA) Fellows collected ocean data, explored the development of a new fishery of the invasive green crab, studied culture methods of the Atlantic razor clam, researched changing seal populations off the coast, and looked at microbial and shellfish ecology in the Damariscotta River Estuary and other coastal Maine waters. Providing students this hands-on learning opportunity enhances research through collaborative work, and prepares students to become successful professionals and lifelong learners as they experience invaluable experience learning outside the classroom. Information generated by the projects will provide data that can be used in a larger research project proposal. “This proposal could have a significant impact on coastal communities along the Maine coast,” says Brian Beal, University of Maine at Machias professor of marine sciences. Dominic Gayton, Owen VanDerAa and Ismael Thadal are investigating how schools could become more involved in their community’s economic prospects and the future of its students. The project is unique because of the interdisciplinary backgrounds of the undergraduate team members. Gayton majors in economics, VanderAa in ecology and environmental sciences, and Thadal in psychology. Together, the team members focus on rural forest economies as they address outmigration and connect it with the education system to see if there is a correlation. They want to understand the “why” — not just the numbers — and how students can have brighter futures in their hometowns. We have designed the Interdisciplinary Undergraduate Research Collaborative program to provide our undergraduate students with hands-on learning opportunities. Our students work in a team environment taking on the major challenges of our day. This project demonstrates their efforts, tackling the challenge of out-migration of younger generations and re-imagining how the education system could help deter this. It’s just the best experience you could have. You build your skills as a scientist, but even more you are building your confidence, learning to network with peers and how to reach out for help. Sarai Smith came to the University of Maine in Orono from the small town of Amesbury, Mass. Shy, homesick and lonely, she struggled academically her first year of college. Then, she found something she was passionate about: research. In the spring of her first year, she took Phage Genomics, a two-semester course offered to first-year biology, microbiology, biochemistry or molecular and cellular biology majors, and to STEM majors in the Honors College. “Immediately, everything just clicked for me,” says Smith, who is double- majoring in microbiology and biochemistry. Smith’s potential did not go unnoticed by Sally Molloy, assistant professor of genomics. She offered Smith the opportunity to participate in research in her lab — a pivotal moment for the undergrad. “This is an excellent example of the opportunities that the UMaine undergraduate students have in learning through the research experience under the mentorship of our dedicated faculty,” says Kody Varahramyan, vice president for research and dean of the Graduate School. A team composed of mentors and students from a diverse pool of fields is collaborating to find solutions to food waste and hunger. human dimensions of climate change, nursing, food and agriculture, chemical and biomedical engineering, ecology and environmental science, and economics all bring unique perspectives to the project. By breaking down silo structures in learning, the whole interdisciplinary team learns to work forward a common research goal. A collaborative effort between UMaine researcher Margo Lukens, professor of English, and Carol Dana of the Penobscot Nation hopes to rekindle the Penobscot language and continue the tradition of passing on some important Penobscot stories. Lukens, who is also director of the Clement and Linda McGillicuddy Humanities Center, says this publication will be the first set in modern Penobscot notation, aside from the forthcoming Penobscot Dictionary. They are creating a modern-day bilingual book showcasing tales of Gluskabe, the Penobscot tribe’s cultural hero. over the chiefs about whether to go to war. All of these themes remain relevant today — and are enjoyable for all ages and cultural backgrounds. of Performing Arts, researches the music of Holocaust victims and honors the artists’ legacy by performing on stages worldwide. At New York’s Carnegie Hall in November 2018, Silver joined other renowned artists as they performed “Hours of Freedom: The Story of the Terezin Composer,” showcasing the works of 15 composers who were imprisoned in the Theresienstadt (Terezin) Concentration Camp during WWII. Phillip Silver, Professor of Music, whose research for the past 20 years has focused on reclaiming for posterity the works of composers who lost their lives in the Holocaust. GSBSE is a unique University of Maine graduate program in collaboration with research and academic institutions in Maine. These are the Jackson Laboratory, the Maine Medical Center Research Institute, the Mount Desert Island Biological Laboratory, and the University of New England. Students from across the nation and the globe are attracted to the innovative programs offered by GSBSE, including the Ph.D. in Biomedical Science, and the Ph.D. in Biomedical Engineering. They gain invaluable knowledge and experience through cutting-edge research, guided by renowned faculty, in first-rate facilities. Research focus areas include Molecular and Cellular Biology, Bioinformatics and Genomics, Toxicology, Neuroscience, and Biomedical Engineering. In June 2018, the U.S. Department of Transportation awarded the University of Maine $14.2 million over the next five years to lead the creation of a highly competitive University Transportation Center (UTC) called the Transportation Infrastructure Durability Center (TIDC). This is the first time that UMaine was selected to lead the more than 30-year-old program. 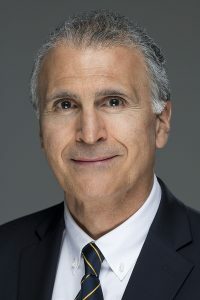 The UMaine-led consortium includes five other New England universities: University of Massachusetts Lowell, University of Connecticut, University of Rhode Island, University of Vermont and Western New England University. Working in partnership with New England state DOTs, TIDC will advance state-of-the- art transportation research and technology to extend the life of transportation assets, including roads and bridges. TIDC will harness the experience of 28 faculty researchers and train 280 student researchers from all New England states to help save taxpayer dollars by extending the life of our transportation assets. UMaine’s Advanced Structures and Composites Center (ASCC) was awarded a $40 million milestones-based grant from the U.S. Department of Energy to deploy two 6-megawatt floating turbines 14 miles off the Maine coast. Offshore wind energy represents Maine’s largest untapped energy resource. The wind in the Gulf of Maine has the potential to generate up to 156 gigawatts of electricity — enough energy to power the state 65 times over. Most of Maine’s offshore wind resource, and nearly 60 percent of the U.S. offshore wind resource, is located in deepwater, where only floating turbines can be used. For over 10 years, UMaine has led development of the patented VolturnUS floating concrete hull technology that can support wind turbines in water depths of 150 feet or more. While UMaine leads in the development of floating offshore wind technology, states along the East Coast are making significant progress forward achieving ambitious offshore wind goals using fixed-bottom technologies. The convergence of UMaine’s established expertise in floating offshore wind, decreasing building costs, and commitments to reduce carbon emissions poise Maine to lead in the burgeoning U.S. floating offshore wind industry. Advanced Structures and Composites Center (ASCC) helped attract a new business to Maine. As a result of formal partnerships with the University of Maine and Front Street Shipyards, Navatek Ltd., a Hawaii-based research and development company, expanded its physical presence in Maine by opening two offices in Portland and Orono, and hiring 16 new employees, nine of whom are UMaine engineering graduates and ASCC interns. University of Maine’s Advanced Structures and Composites Center (ASCC) received $500,000 from the Maine Technology Institute to form a technology cluster to help Maine boatbuilders explore how large-scale 3D printing using economical, wood-filled plastics can provide the industry with a competitive advantage. Small to medium boat-building companies are often challenged by the cost and lead time required to create traditional marine tools and boat molds. 3D printing, or additive manufacturing, can help significantly reduce the production time needed to fabricate boat molds by as much as 75 percent, according to ASCC researchers. 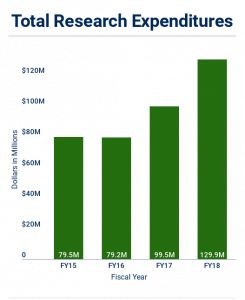 To address the high cost of large-scale 3D printing, ASCC is leading in the development of a range of economical wood-filled feedstock materials. The use of the wood-based fillers significantly reduces the cost and increases the stiffness/toughness of the material while reducing the environmental impact and improving recyclability. UMaine’s vital research in bio-based materials prompted the U.S. Department of Energy’s Oak Ridge National Labs to partner with ASCC to advance bio-based additive manufacturing and cultivate a new industry for the state’s forest products sector. In August 2018, the University of Maine unveiled and tested an innovative, rapidly deployable bridge system designed at the Advanced Structures and Composites Center (ASCC) and made possible by research sponsored by the U.S. Army Corps of Engineers. The lightweight composite bridge girder was able to withstand forces up to 376,000 pounds before breaking/failing (equal to 94 cars stacked on each other), 7.5 times the design and load requirements from the American Association of State Highway and Transportation Officials. little to no maintenance. The bridge system takes advantage of the unique properties of both composite materials and precast concrete, and is designed with construction logistics in mind. Weighing just a fraction of traditional steel girders, the composite girders can be stacked, shipped and erected with locally sourced common rental cranes. The first installation of the bridge system is already planned in 2019 by the Maine Department of Transportation. In October 2017, the University of Maine was awarded a $454,532 grant from the U.S. Economic Development Administration (EDA) for the creation of the Maine Mass Timber Commercialization Center (MMTCC). MMTCC brings together a variety of regional stakeholders to revitalize and diversify Maine’s forest-based economy by accelerating the use of Maine-sourced timber in innovative mass timber products for large-scale construction projects. These innovative products include engineered wood composites, such as cross-laminated timber (CLT), which can replace traditional construction materials like steel and concrete. The development of advanced timber products will make Maine more competitive in the North American mass timber market and yield positive economic impacts, particularly in Maine’s rural communities. A CLT manufacturing facility would create jobs for loggers, truckers, laborers and more. Funding for MMTCC is a result of the EDA’s effort to leverage federal resources to support the economic revitalization of Maine’s mill communities. The School of Marine Science’s Ocean Observing System is at the forefront of national development of real-time monitoring systems. UMaine’s system utilizes an unusual diversity of sensors and platforms that record conditions in the Gulf of Maine in real time, informing fishers, scientists and weather forecasters. In the past year, the system provided background data critical for the development of offshore wind power. • Yong Chen’s models for Atlantic herring and northern shrimp stock assessment in the Gulf of Maine provided guidelines for the Atlantic States Marine Fisheries Commission. • Richard Wahle’s American Lobster Settlement Index monitors lobster repopulation, and made significant contributions to research on lobster population dynamics and effects of climate change on the lobster fishery. • Paul Rawson’s work supported species diversification and growth in Maine’s shellfish aquaculture industry with his improved carrying capacity models for Eastern oyster culture. • Andrew Thomas recently applied remote sensing techniques to assist aquaculture development in Maine and Alaska. • Damian Brady’s research has been used by the aquaculture industry to develop new tools for site selection. • Heather Leslie chaired the Alliance for Maine’s Marine Economy, a partnership involving university and nonprofit research institutions, commercial fishing and aquaculture interests, community-based organizations and private-sector businesses in Maine. Evaluations were conducted on consumer preferences between domestic and imported fish, reactions to aquaculture products and seafood labels, willingness to pay for local and sustainable seafood, and efficiency of oyster production. Professor of Food Science and Human Nutrition Mary Ellen Camire worked with VitaminSea Seaweed, a Maine company, on the technical and market feasibility of kelp meal as a nutritional supplement in low-moisture foods. The Aquaculture Research Institute (ARI) is the voice of aquaculture at the University of Maine. ARI conducts, supports and facilitates research on the sustainable development of the aquaculture industry, while providing leadership and coordination for education and outreach efforts. 80 undergraduate researchers placed with academic and industry partners through Maine EPSCoR’s National Science Foundation-funded Sustainable Ecological Aquaculture Network (SEANET) grant each year. 2018 saw the completion of Maine’s first state-of-the-art Ocean Acidification (OA) Lab based at the Aquaculture Research Center (ARC) in Orono. The project was a two-year effort to install four recirculating systems that are temperature and pH controlled. Liz DePoy’s passion for farming led to her research on aging Maine Farmers. This groundbreaking project studies aging farmers in rural communities. She hopes this will result in programs and services in support of those communities. Emily Haigh investigates how older adults respond to stress and sadness to unlock clues about mental health. Rebecca MacAulay’s CARE Lab connects Maine’s older adult population with UMaine research to study brain health in older adults and the tools used to diagnose dementia. 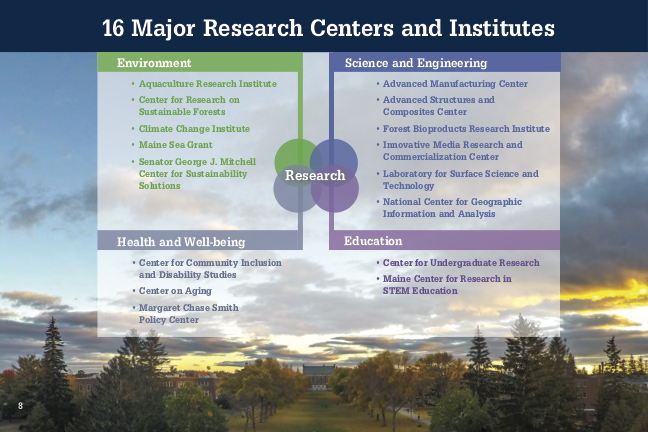 The University of Maine has an extensive set of major research equipment and resources made available through CORE. 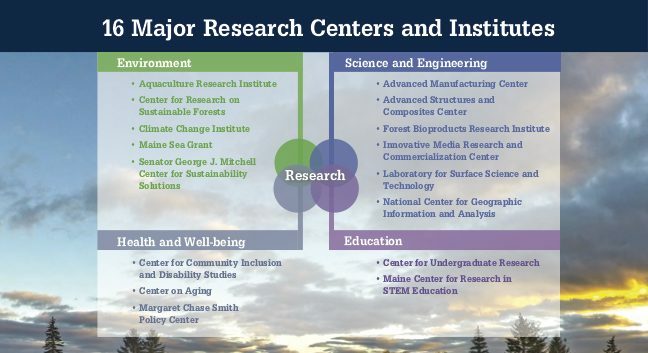 CORE centralizes major research equipment and facilities at the University of Maine to make it easier for anyone to find and use — whether it’s internal research faculty or staff, or external clients who want access to this equipment for their own research. The goal is to become a one-stop shop for access to these critical research tools.